Two business cards of Johannes Brahms, with address of IV. Karlsgasse 4. The first has, on verso, an MS note in an indecipherable hand, dated 23 March 1888, with a further note in a different hand translating it and stating that it gives ‘congratulations upon birth of Edward R. Speyer, born 18th March 1888’. 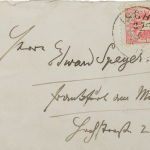 With envelope addressed, again in Brahms’s hand, to Edward Speyer in Frankfurt-am-Main and postmarked 23 March 1888. 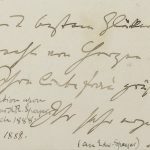 The second has another indecipherable note on verso, and a later transcript in German, stating it was sent from Vienna , 27 June 1890 . This is also accompanied by an envelope addressed in Brahms’s hand to Edward Speyer, Frankfurt-am-Main, and is postmarked 27 June 1890. *Edward Speyer, German/English music agent and a great friend of Brahms.